Solid Capture allows you to capture screen images in seconds with minimal effort. Using a hot key or a button, you can copy a screen or part of a screen and send it to the clipboard, a file, or your favorite graphics application. Capture modes include Full Screen – Captures the entire visible screen area, Window – Captures a window or part of a window. 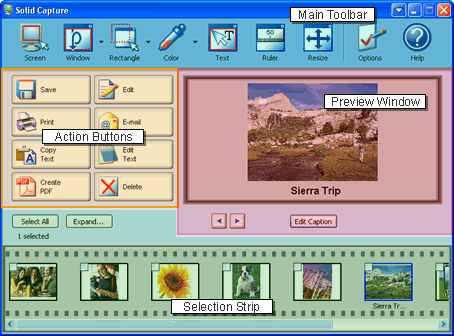 You can choose from: Window capture – Captures the displayed active window, Scrolling window – In Internet Explorer, captures both the displayed window area and the hidden portion on the bottom of the screen, Rectangle – Click and drag to highlight any rectangular area of the screen, then release to capture. Solid Capture saves images in your favorite graphics file format, including BMP, JPG, TIF, GIF, or PNG. To get your free genuine licensed copy Solid Capture worth US$29.95, follow the simple steps below. Enter email address and name and then click on Register button. Check your email and note down the User Name, User Email, Organization and Unlock Code you have just received. Download the latest version of Solid Capture. Enter your Name, Email, and Organization and code you just received in the email.